The Mars Science Laboratory (MSL) is a robotic probe on a mission to study Mars with international support. It has been achieving its goals by finding signs of habitable conditions that would have supported biological life improving our understanding of the kind of environment Mars once had. It has faced delays and setbacks, but will provide necessary experience for developing future manned missions to the planet. It will also likely continue on its journey for some time exploring the Martian surface. MSL is extending the depths of our understanding of the solar system and sits at the forefront of space exploration. The path that Curiosity has followed since landing in 2012 (Grush, 2016). The high-level goals of MSL set by NASA are to study the soil on the Martian surface for signs of biological life. They hope to achieve these goals by equipping the rover with instruments that can perform chemical analyses on soil samples collected from the Martian surface. It also has the auxiliary goals of testing new landing techniques that include more automation and autonomy on the part of the robotic probe, which proved successful with the landing of its single rover called Curiosity on August 6th, 2012 (Amos, 2012). MSL is achieving the goals NASA set for it by finding things like silica deposits, which are associated with environments conducive to microbial life (Chappell, 2015). Interesting to consider that silica is a compound of oxygen and silicon (Si), a semiconducting material used in transistors and integrated circuits. The interesting question is whether biological life forms could be based on an element other than carbon, and one such element considered by academics is silicon because of its similarities to carbon (“Could silicon be the basis for alien life forms, just as carbon is on Earth?”, n.d.). The Curiosity rover itself almost certainly has some silicon parts too. Curiosity also recently found boron, which was a positive sign, because of its water solubility (Grush, 2016). 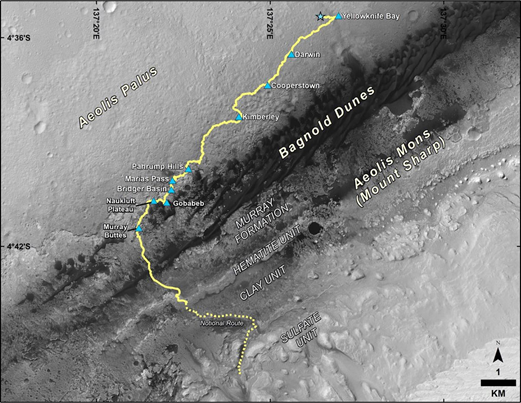 The boron is indicative of a lake that may have once existed in the Gale Crater. The journey of the MSL robotic probe to Mars has not been without problems and critical moments of difficulty. It has, however, been a relatively calm journey overall in comparison to other unmanned missions. During its development, the rover’s launch had to be delayed multiple times because of engineering challenges and design problems with, among other things, its heat shield (Chang, n.d.). NASA did not think it would be a good idea to compromise the mission and decided to extend the rover’s development for two more years for further testing (Matson, 2008). Testing of the rover’s equipment also led to increased costs as a result of the delays and changes to the rover. Curiosity was actually designed with shutdown features that would protect the probe in certain hazardous situations that could destroy it. On several different occasions since landing, Curiosity has put itself into a safe mode before scientists rebooted the rover. These incidents were caused mostly by software problems including memory management (Lumb, 2016). If NASA had not been able to recover the rover, it would have clearly resulted in mission failure and would mean that its retirement could not be delayed any further. The future of MSL has mixed projections, some positive and some not as positive. Curiosity has already outlived its original expected retirement date. Even after Curiosity is officially retired, its future will still be its legacy of discoveries also leaving a lasting impact on our future manned missions to Mars. However, Curiosity has already showed signs of aging as A.I. and robotics has continued on its exponential advance since 2012. Even worse, the rover hasn’t really found any real evidence that biological life once existed on the planet, one of its primary goals. This has led Astrobiologists to consider other novel ways of finding life on the red planet. They suggest that deeper subsurface analysis for life would be better than our current method of simply finding where water reservoirs and lakes were because we could find fossils as well as microbes in groundwater (David, 2017). It’s also true that these bodies of water probably moved around as a result of continental drift caused by the shifting of tectonic plates that may actually still be occurring. In conclusion, I feel the Mars Science Laboratory mission has gone very well despite its shortcomings. The Curiosity rover has found some positive signs, such as elements like silica and boron, which could indicate an environment that would have supported life. It may also be beneficial if we incorporated other strategies for finding life on the red planet. Curiosity, like its predecessors, is still only the beginning of our journey to Mars. This entry was posted in Aerospace Engineering, Robotics, Software Development, Space Science and tagged curiosity rover, gale crater, mars, mars science laboratory, nasa on June 23, 2017 by Robert B. Colton. The below image should convey to you how a simple assignment statement is broken into a stream of tokens then an AST is generated as JSON on the right. This is why symbols like * + – are called binary operators because they take two operands, ! is the logical negation and an unary operator becaues it takes only one operand. The operands can also be expressions because expressions are defined recursively in terms of expressions which can be literals, terms, or other expressions. This is how we end up with tree’s which when coupled with additional semantic information such as keywords, types, and identifiers help us do code generation. This enables you to take in one language, say GML, and spit out a completely different one like C++ which, if you don’t already know, is exactly what ENIGMA’s compiler does. An abstract syntax tree is produced by a parser after the lexer phase breaks code into a stream of tokens. Wikipedia has additional information on abstract syntax trees if you would like to know more. The following StackOverflow post provides clarification between an AST and a parse tree. 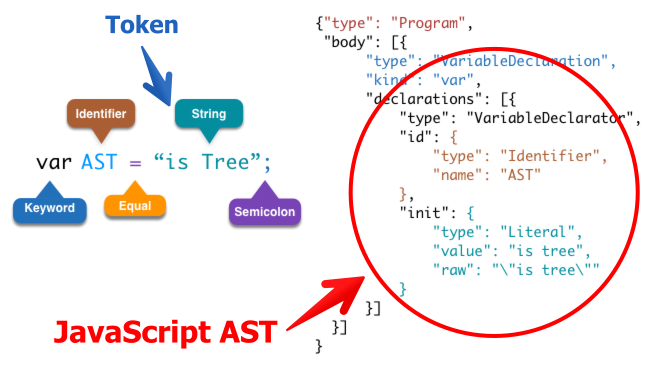 This example shows you how to get the AST as JSON from Java. This was my own discovery from studying the Nashorn source code. It is important to note however that this interface may change because it’s not well documented and is new to the JSE. Additionally the OpenJDK project is developing a public interface for Java 9 that allows AST traversal in a more standard and user friendly way. Limited documentation for the existing public Nashorn classes in Java 8 can be found below. The following link provides a list of all of the parser and compiler options that I set above. However it is important to note that the syntax is different when setting the options inside Java where – is replaced with a period. The Nashorn source code can be found on GitHub and also on BitBucket. I prefer the BitBucket version as the GitHub version seems to be missing some classes.